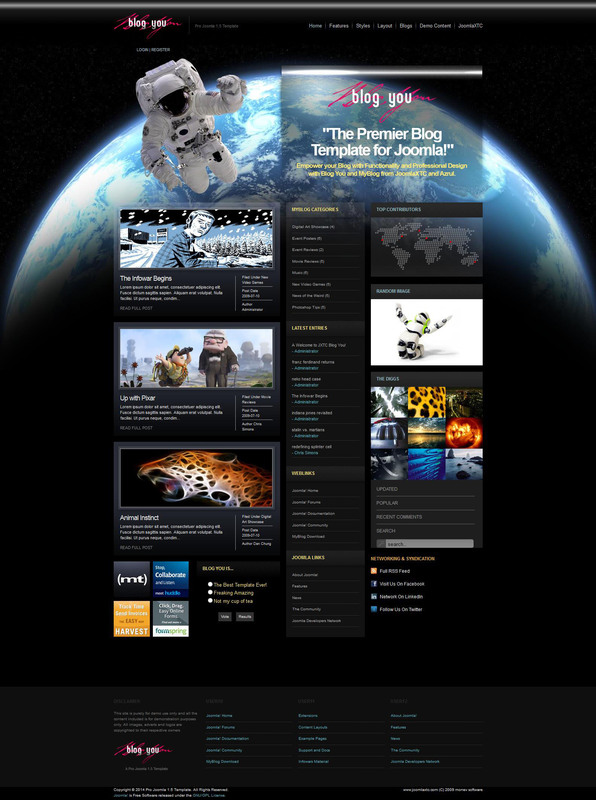 JXTC Blog You - cosmo template for Joomla 1.5. The studio has developed a very original JoomlaXTC XTC BlogYou template for creating your own internet pages. Depending on your mood, you can choose any of 12 styles of interface design. XTC BlogYou template based on the framework, structural of XTC Framework, whereby control settings from the control panel comes with the utmost ease. Also along with the template supplied XTC BlogYou theme designed for components and JComment IDOBlog. Design template XTC BlogYou made on CSS. Template XTC BlogYou has multicolumn structure, with 19 positions for the installation of additional modules and compatible with all browsers. Template XTC BlogYou gives unlimited possibilities for creating your own online diary. Template XTC Blog You installed on Joomla 1.5.